Saturday, February 3, 2018 - Puddlecycle - Get Involved! The artist Carye Bye used to regularly have group bike rides to small museums around Portland, but those came to an end when she moved to San Antonio a couple years ago. This ride is a partial repeat of her Sellwood ride, and visits three small (and free) museums. We start at Movie Madness which is not only a video store but also a museum with many original movie props and costumes on display. From there we ride to the Sellwood Museum, which re-opens this day after a remodel and exhibit update. 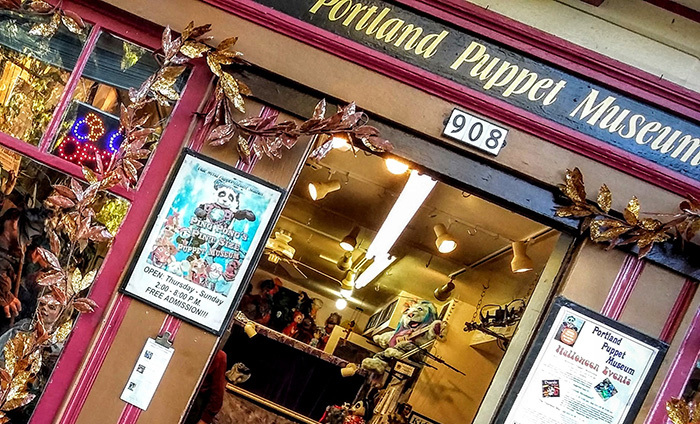 And we finish at the Portland Puppet Museum, which not only displays many unique puppets but also presents puppet shows. This non-loop ride is 9.5 miles long and ends near the Springwater Corridor in Sellwood.